Outline: For Catholic and Orthodox areas. Pre-supposes Catholic background and knowledge. Emphasizes Mary's instructions to the servants at the wedding, relating it to our attitude toward Christ--doing His commanda, praying, believing, obeying. Truth of "one mediator," faith in Christ alone, worshipping God only. 2. I'm reading God's Book, the Holy Bible. 1. Can you understand it? 2. Some I understand and some I don't. But this part that I am reading a child could understand. 1. Oh, is that so? What is it about? 2. It is about a wedding Jesus went to. His mother Mary was with Him. During the wedding feast, the wine ran out. Mary told Jesus about it. She knew He could help. 1. What did He do? 2. He didn't do anything immediately. But Mary was sure He would help, so she told the servants to be sure to do whatever He told them. 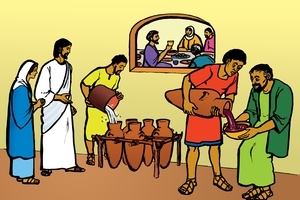 After a little while Jesus told them to fill the wine jars with water. They did just as He told them. And what a surprise - the water changed into wine! 1. Oh, that was a miracle! 2. Mary knew that God had sent Jesus from heaven, to be born on earth. She knew that because He came from God He could do anything. She also knew that Jesus came so that He could save us from our sins. I have been thinking about that. Mary told the servants to do what Jesus told them to do. I think that Mary would still say this to us if she could because she knew God wants us to do what Jesus tells us to do. 1. But Jesus isn't here to tell us what to do. 2. Oh, but the Bible tells what He is saying to us, but we don't pay attention. 1. What does it say then? 2. It says that Jesus told His followers not to pray the same words over and over without thinking. He said we should pray as if we were talking to God -not just saying words. Jesus said also that He is the only One Who can save us. Therefore we must not worship or pray to anyone except God. He said that no one could come to God except through Jesus. Jesus is our only Mediator (One who goes between God and men). He said, "I am the way, the truth, and the life." All who truly believe Jesus is the Son of God and put their trust in Him are saved. That is what is written in God's book. [It says. "God has given to us eternal life, and this life is in His Son." It tells us that the one who has the Son of God - Jesus - has eternal life. That means you will go to heaven immediately when you die if you believe Jesus' words and follow Him.] This has made me think. We do not believe Jesus' words as we should. We do not pray as He told us; we do not trust and worship Him only. Let me ask you this - did anyone else die to take the punishment for our sins? 1. No, it was Jesus. 2. The Bible says there is no other name given under heaven whereby we may be saved, only Jesus. He died in order to save us, but death could not hold Him. He rose again. The Bible says this, "We have a great high priest that is passed into the heavens, Jesus the Son of God." Now I understand what I must do. I will follow Jesus and do what He tells me to do. I will trust only in Him. I will not pray to anyone else. He alone is my Saviour and my Helper.